The Cannes Film Festival might seem an unlikely location to sabotage a presidential campaign but if you put yourself into a Bond, James Bond, frame of mind, it was the perfect venue for an evil villain to release a propaganda film to the unsuspecting glitterati, giving it prestige and credibility that its content lacked. Clinton Cash, the film version of Peter Schweizer's book, debuted in Cannes in May of 2016. The film alleges Bill and Hillary Clinton profited personally from their nonprofit organization, the Clinton Foundation with a Pay To Play scheme. It should be mentioned that Schweizer's book was published in May of 2015 and since then, none of his allegations have been proven, no charges have been filed, the Clinton Foundation still has high ratings as a non profit, and still retains its nonprofit status. In an irony rich case of projection, the Clinton Cash documentary was written and produced by staff members of the Government Accountability Institute (GAI), a nonprofit organization. The documentary, as well as the book, was promoted by the Government Accountability Institute. GAI's involvement was an abuse of their tax exempt status as a 501c3 nonprofit organization. 501c3’s cannot engage in campaigning for or against any political candidates. Neither directly or indirectly. Would it surprise you to learn that Stephen Bannon, producer of Clinton Cash, was the founder and Chairman of the Board of GAI? Bannon cofounded GAI in February of 2012, appointed himself chairman of the board, and managed to get the Franklin Center for Government And Public Integrity to donate $2 million to finance this brand new nonprofit. Two weeks later, Andrew Breitbart passed away and Bannon was asked to take over Breitbart's little internet media empire. Bannon has been running Breitbart News since 2012 and, according to the tax records of GAI, he's also been putting in 30 hours a week as chairman of the board for an annual salary of $100,000. Did I mention that GAI is located in Tallahassee, Florida? That's a long commute. You may have heard that Bannon was under investigation by the FEC for voter fraud because he’s registered to vote in Florida but doesn't live at the address where he's registered. Bannon doesn't actually live in Florida, yet he's able to put in 30 hours a week at GAI. Miraculous. As for the rest of GAI, there's a staff of around twenty people hired as researchers and writers. Leading the staff is Peter Schweizer, also a cofounder of GAI and its president earning $220,000 dollars a year. This is the same Peter Schweizer who wrote Clinton Cash. Coincidentally, he’s also a writer for Breitbart News. Another principle staff member is Wynton Hall who gets paid $175,000 a year as Communication Strategist-whatever that is. Yes, he's also a writer for Breitbart News but Hall has a side business as a professional celebrity ghostwriter which makes me wonder who really wrote Clinton Cash? In the 5 years of its existence, GAI has received around $10 million dollars in tax free donations. The majority of the money going to salaries and operating expenses. Their website g-a-i.org has 21 "investigations" listed but that's very misleading. Looking at the list of PDF investigation files individually, several are interviews with Schweizer and a couple more are about books he's written. There's also a couple pie charts and spreadsheets to supplement Schweizer's books. There are really only 5 files that might qualify as valid investigations and altogether they total around 150 pages. So GAI's investigations, utilizing the manpower of 20 people, are running $2 million dollars each. One of the investigations listed promotes another book by Schweizer called, Bush Bucks. That book was published in October of 2015 during Jeb Bush's presidential campaign which is another instance of GAI ignoring IRS rules and involving itself in campaigning against politicians that Bannon doesn't like. No political campaigning, directly or indirectly, for, or against, any candidate running for a political office. No activities that serve the private interest, or private benefit, of any individual or outside organization. No means no. There isn't a special exemption because your documentary was shown at the Cannes Film Festival. As for the documentary, the credits from IMDB for Clinton Cash, are very telling. Heading the list is Stephen Bannon, who found time to produce the film while also running Breitbart News and putting his those 30 hours a week at GAI. Associate producer, Eric Eggers, who is a staff member at GAI. Dan Fleuette has worked with Bannon on other conservative films. 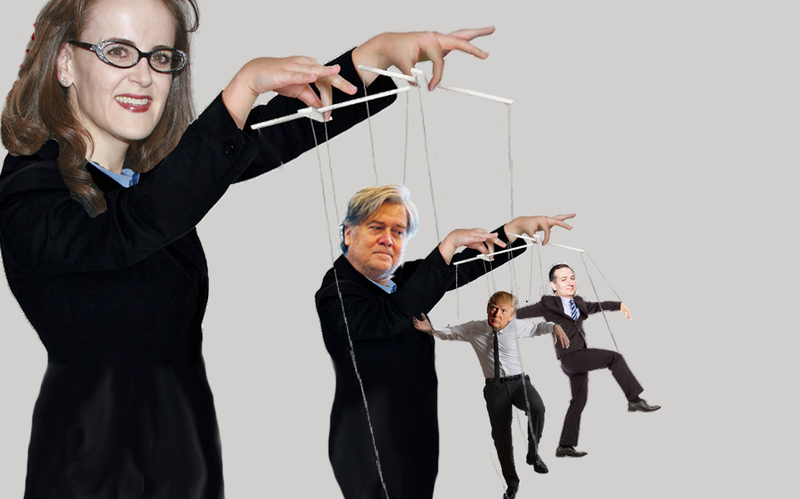 Rebekah Mercer is a GAI board member and daughter of conservative billionaire, Robert Mercer who finances Breitbart News. And of course, Peter Schweizer, president of GAI and author of Clinton Cash. Bannon Film industries is of course, Stephen Bannon’s film company. Glittering Steel, the other production company listed, is also a Bannon company. 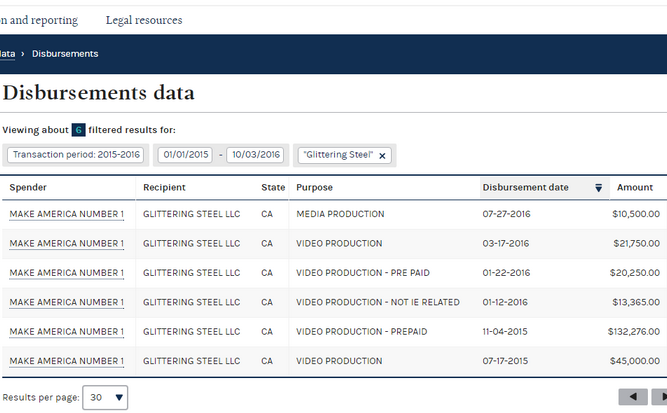 Glittering Steel was paid a lot of money by Keep The Promise to try and get Ted Cruz to be the 2016 GOP presidential nominee. After Cruz dropped out, Glittering Steel became an asset of the Trump Campaign, getting paid thousands and thousands of dollars. Glittering Steel, along with Bannon Film Industries and Breitbart News, all share the registered address of Stephen Bannon's accountant at 8383 Wilshire Boulevard, suite 1000. That's a lot of incestuous relationships involving Stephen Bannon, and a lot of money going to that address. It's also a major conflict of interest for a tax exempt nonprofit organization. Every time GAI posted anything about Hillary Clinton or Schweizer's books on their youtube, facebook or Twitter account, they violated their 501c3 tax free status. Every time Schweizer made a public appearance to promote Clinton Cash or any of his other books and mentioned he's president of GAI, he violated GAI's tax free status. 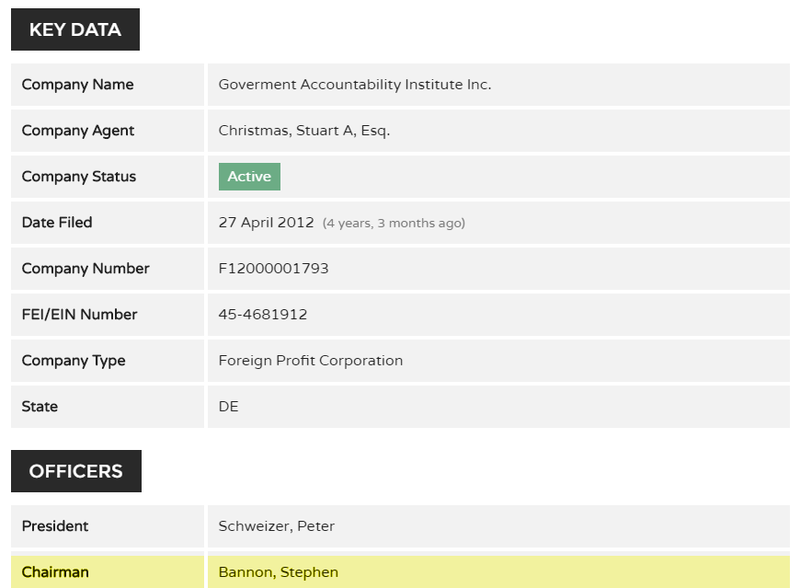 Every time Schweizer, Bannon and Hall posted an article on Breitbart news using data from GAI they violated GAI's tax free status. GAI and its staff were actively involved in political campaigning against presidential candidates, namely Barack Obama, Hillary Clinton, Marco Rubio and Jeb Bush. The mission statement of GAI is "to investigate and expose crony capitalism, misuse of taxpayer monies, and other governmental corruption or malfeasance." That's funny isn't it? The Government Accountability Institute really should investigate themselves. Stay tuned for more... Check under the Government Accountability Institute label for more posts.